Have You Made A Resolution To Help Others This Year? 3 simple ways you can use your free time to better the community…and yourself! If you are looking for New Year's Resolutions that help others AND help you achieve personal goals, such as exercising and eating healthy, look no further. We have three ways you can you use your free time to challenge yourself and make an impact in your community year-round. Did you know St. Vincent de Paul has three Urban Farms? Our farms provide organic, fresh fruits and vegetables (and sometimes fish!) to our kitchen and dining rooms. This greatly enhances the nutritional support we’re able to offer our guests in our dining rooms. Not to mention, working in a farm provides excellent opportunities for personal wellness and physical activity. 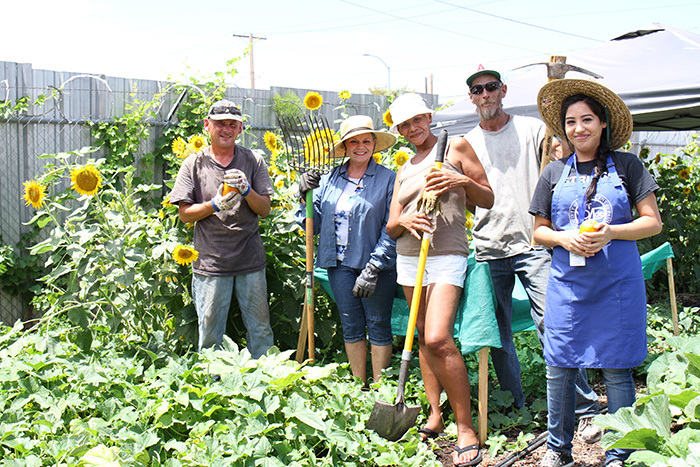 Put on your hat, sunscreen and work clothes, and join the SVdP Urban Farm team as they put you to work on the very soil and vegetables that feed our guests. Volunteer duties may include (but are not limited to): watering, weeding, harvesting, planting, waste and produce sorting, composting and tree trimming. Sign up at one of our three locations today! Does your list of resolutions include achieving professional growth in 2017? We can help! Volunteering at organizations like SVdP helps you gain new skills in different program areas, including leadership skills, while helping those in need at the same time. According to our Volunteer Services Office, one of our biggest needs is finding volunteer leads. “We like to encourage our volunteers to not just come in and volunteer for a couple of hours, but to take a leadership role in their community by managing and training a group of volunteers,” says Jessica Berg, SVdP Chief Service Officer. Reach out to our Volunteer Services Office today to learn where you can give back and train others at the same time! At beginning of the year, many of us set intentions to step out of our comfort zone and try something new. We feel the same way when it comes to our volunteer opportunities. In the past year, we’ve added some new and exciting opportunities that you may not know about yet. For many people, tamales mean "home and family." These two values are extremely important at SVdP. You can help us bring a sense of home and family to our guests by hand-making tamales at our main kitchen. This is a brand-new opportunity at SVdP and we’d love for you to join us in kicking off this new tradition. 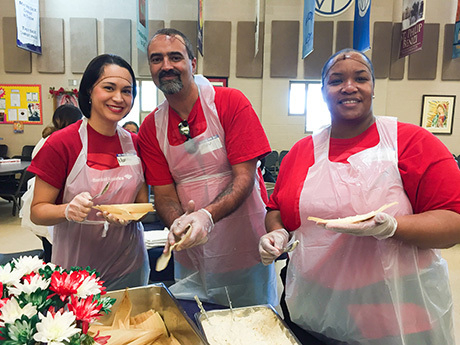 Email or call our Volunteer Services Office today to sign up for the next Tamale Tuesday: volunteer@svdpaz.org or 602-261-6886. Did you know SVdP runs an emergency, temporary shelter for 275 adult men and women experiencing homelessness? Our goal is to provide our guests safe and welcoming accommodations, while encouraging them in appropriate services and housing connections. The shelter, located at our downtown dining room, is a unique volunteer opportunity where every shift is different, but there is always an opportunity to bring hope, joy and encouragement to those who need it most. Volunteer duties include (but are not limited to): shelter set-up, check-in, and handing out water, snacks, sheets and other supplies. Each day, two very dedicated SVdP outreach workers go out onto the streets of Phoenix and its outlying areas. 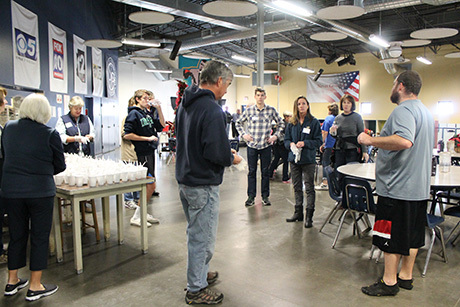 We hand-deliver water, sack lunches, hygiene packs, clothing and other seasonal items to those experiencing homelessness, but who may be too far away or physically unable to visit one of our dining rooms. This is an activity for those looking to get out of their comfort zone and a wonderful opportunity to see and be love in action. Volunteer duties include helping to load the truck, carrying a backpack of supplies to hand out, walking around and engaging with and serving those living on the street. Thank you for your desire to serve the community! Your support is an incredible blessing to those in need and we look forward impacting and improving our community with you in 2017. Support Ozanam Manor, our shelter for adults who are over 50 or have disabilities. Help us provide shelter and one-on-one case management for some of the most vulnerable neighbors.